This unpeated whisky is distilled from an old variety of barley that gives it old style flavours. 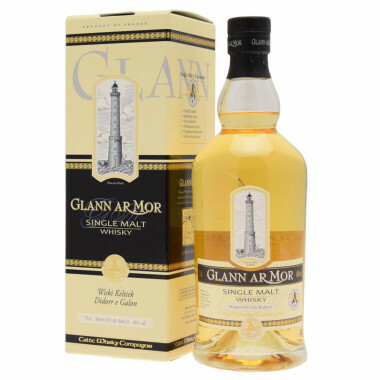 This Glann Ar Mor unpeated whisky is distilled from Maris Otter Barley, a variety of barley that gives it the full flavours of whisky made in the old days. The colour of this whisky is pale gold. The nose reveals egg cream notes and also brown sugar, vanilla bourbon and caramel notes. We can find the freshness of white flowers, fruits like apricots, mirabelles or lemons. The palate is soft and silky. We can find pears and apricots notes that gives a pleasant sentation int the mouth. The soft taste of barley is developped in the mouth. The finish is strong, moderately long. The touch of citruses and pears is nice. Glann Ar Mor means "next to the sea" in Breton language. In 1999, Martine and Jean Donnay chose this authentic marine environment for their distillery. This geographical location has an important role in the aging process of these breton whiskies: the temperature, humidity and the maritime climate. Nose: egg cream notes and also brown sugar, vanilla bourbon and caramel notes. We can find the freshness of white flowers, fruits like apricots, mirabelles or lemons. Palate: soft and silky. We can find pears and apricots notes that gives a pleasant sentation int the mouth. The soft barkley is developped in mouth. Finish: strong, moderatelyn long. The touch of citruses and pears is nice.